It is finally feeling like summer the past few days, rather than spring, and today is another sunny and HOT day. Students completed their exams last week and the December to mid-January summer school break commences one week from now. Jim took 2 groups of youth summer job-hunting last week and Zamela was hired on-the-spot at a gas station and car wash. There are no automatic car washes or self-serve gas stations in Knysna and yesterday Zamela and his colleagues hand-washed 30 vehicles! We identified 3 more promising summer job opportunities at 2 local restaurants and expect to learn more later this week. The boys were very scared to enter a business at first, but after some coaching and a positive experience at the first few places, it soon became fun for them. 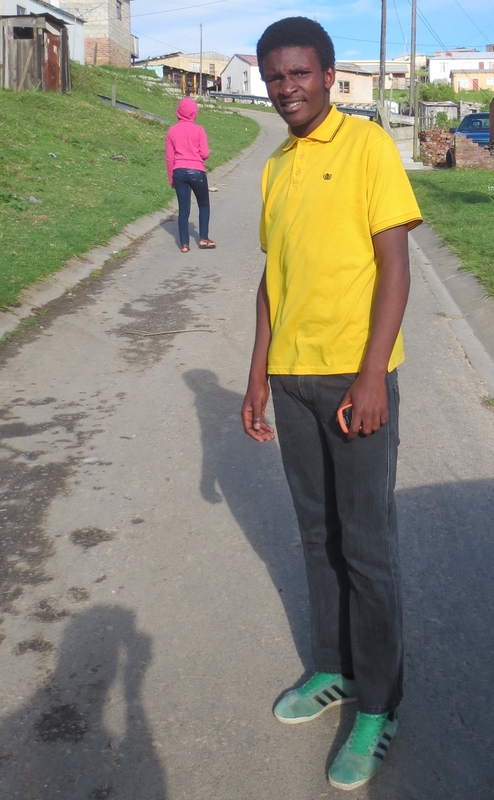 Mxolisi just completed grade 7 and started attending one of Janet’s tutoring groups 1 year ago. The sneakers he is wearing are his only shoes. They are too small, and the lack of shoe laces has nothing to do with ‘style. Mxolisi’s school shoes became unwearable in August and he has been wearing these sneakers (called takkies in South Africa) to school ever since. Janet took Mxolisi shopping last Tuesday and he now has new school shoes. His father is in a wheel chair and does not work, and his mother sells candies to people in the township to earn money. Mxolisi was very excited and appreciative of his new shoes, as was his father who sent us a very nice message of gratitude. The 2nd meeting of the first “Tomorrow’s Fathers” group for youth growing up with absent fathers was a success and the boys really enjoyed the short video clips profiling other fatherless youth, and absent fathers. One 18 year-old boy told his life story of growing up without a father, his mother leaving him at age 13, turning to a life of guns, crime, drug-dealing, and eventually ending up in juvenile detention, before finally turning his life around. You could hear a pin drop as he spoke and despite the fact that many of the boys and another youth leader have known this boy for a number of years, none were aware of his background and the story he shared. All the boys agreed that this young man is now a positive role model and we commended him for his accomplishment. When schools re-open mid-January, Jim will be starting a 3-4 week program for fatherless grade 9 and 10 boys at one of the township high schools. The group will meet once-a week for 3-4 weeks with eight boys who have been identified by their teachers. Every 3-4 weeks, a new group of 8 boys will be selected by the grade 9 and 10 teachers. Thank you to each of you who support our ongoing efforts here in South Africa. Some of you sponsor specific youth, and some donate funds to use at our discretion. Both forms of support are important and very appreciated. There is so much more we could share with you from the past 7 days, however the point is that deserving youth are being helped and their lives are changing for the better.